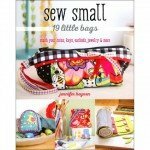 Sew 19 simply embellished projects (with full-size patterns), including a card holder, coin purses, earbud holder, small wallets, pouches and organisers. These cute and useful bags are perfect for holding and organising all of your little things. Personalise the organisers with adorable embellishments and appliques and use up your scraps, trims and other odds and ends in the process. Whip one up in an afternoon or bring your handwork with you - small pieces make these projects fun and easy to work on anywhere. Great to give as gifts or keep for yourself, these tiny bags will bring a smile to anyone's face. Artist Minki Kim turns her own daily sketchbook challenge into 65 stitchable drawings to mix and match. Embroider and appliqué the whimsical, easy-going way with 6 useful projects to make and share, like a simple zipper pouch for the teacher, a cozy pillow for a handsome chair, or a wallhanging for your family room. Minki’s uplifting designs, plus an extra gallery of small project ideas from coasters to wall art will appeal to anyone who wants to add personality to their home and personal accessories. Make the most of even your smallest stash of fabrics by creating adorable, fast, fun, and useful gifts for yourself, friends, or family. 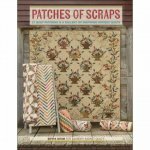 The next highly-anticipated book from famed designer Edyta Sitar is a scrap-lover's fantasy! 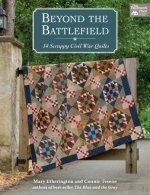 Packed with breathtaking scrap quilts--each featuring myriad fabrics--you'll discover two inspiring ways to enjoy them. First, the antiques: more than two dozen photos of gorgeous scrap quilts from yesteryear, most shared from Edyta's private collection. Rich photography and industrial settings showcase the utilitarian nature of these incredible works--a spectacular sight! Second, the patterns: choose from quilt designs in a delightful melange of colors and prints that you can re-create with your own mix of fabrics or scraps. 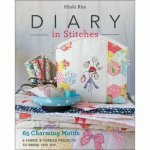 English paper piecing is a popular and easy method of creating handsewn patchwork designs. Fabric is cut and folded over a paper template and shapes are stitched together by hand, making it ideal for sewing when you're out and about, travelling, or sitting quietly at home. 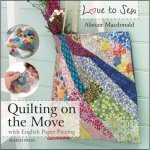 Following in the style of the highly successful Love to Sew series, author Alistair Macdonald provides 20 fabulous projects, including a baby's playmat, a scarf, a scatter cushion, a hobby bag, a tea cosy, a tote bag and a make-up purse. All are hand-sewn using the English paper-piecing method. Templates for all the projects are included, and there are basic, step-by-step instructions on this classic technique at the beginning of the book. 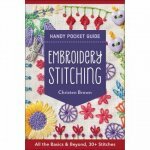 This quick and easy mini book includes over 30 embroidery stitches -- both starter stitches and more advanced combinations. Beef up your needlework know-how with expertise on everything from choosing threads to adding embellishments. 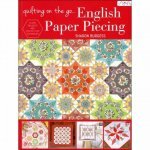 In her new book Quilting On The Go: English Paper Piecing Sharon shares with you her love for English Paper Piecing and Fussy Cutting. 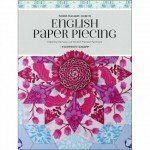 She will guide you through all the steps of English Paper Piecing, starting with the basics. Work your way from the humble hexagon to stars, curves and more. Sharon shares her tips, techniques, and her preferred products to help you achieve great results and what to look for when choosing fabrics to fussy cut. 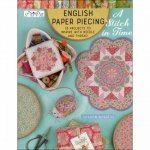 A Stitch in Time contains 18 projects, each with a touch of English Paper Piecing combined with embroidery, hand quilting, pretty laces, and trims, all designed to encourage readers to pick up a needle and thread. 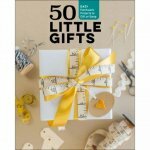 This book contains projects that will entice crafters to cut into their precious and most treasured fabrics, even repurposing a vintage linen, bringing them to life in projects to share, give as a gift, or to keep for oneself. Projects include: Fussy Cut Candle Mat, Vintage Pouch, Baby Quilt, Sewing Accessories, and more. 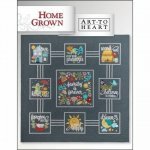 Written by Nancy Halvorsen, the Art to Heart, Home Grown Book celebrates home and family values. 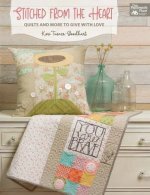 The book includes large quilt patterns, mini quilts, pillows, table toppers, tea towels, aprons, and pot holders. The Home Grown Book has 48 fun, filled pages of projects that will keep you busy for months to come. Simple stitching is always in season! Showcase seasonal delights in small, quick-to-sew projects that feature sprinkles of sweet embroidery, patchwork, and appliqué. Whimsical motifs capture everyday pleasures, from springtime flowers and buzzing bees to plump pumpkins and frosty snowmen. From beloved design team Country Threads comes an all-new collection of patterns inspired by quilts from the Civil War era. 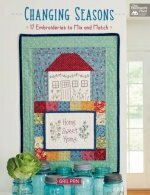 The pair's signature make-do style comes to life in 14 designs featuring a range of sizes, including small, simple-to-sew tributes and larger quilts featuring hundreds of scrap fabrics. In Flossie Teacakes’ Guide to English Paper Piecing, author Florence Knapp shares her love of this handsewn patchwork technique through step-by-step tutorials, original patterns, and inspiring articles on the beauty and benefits of creating with our hands. 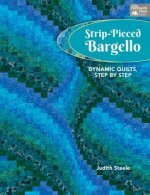 Make mesmerizing bargello quilts with the easy-to-follow instructions and charts included in Strip-Pieced Bargello. It's like quilting by number! Start with as few as four fabrics to sew a table runner, wall hanging, tote, tree skirt, or larger quilt. 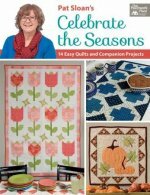 Each season offers something special to celebrate - and Pat's easy-to-make projects will help you welcome each turn of the calendar page. 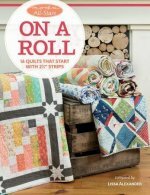 The All-Stars are back with sparkling projects for irresistible Jelly Rolls - coordinating precut 2 1/2" strips of fabric that slash cutting time and speed up sewing time. Patchwork reigns in 14 quilt patterns created by favorite Moda designers. From simple and classic to fresh and contemporary, beautiful quilts will inspire you to get the ball rolling! 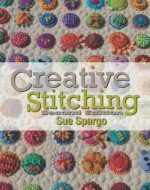 Creative Texturing, the companion book to Creative Stitching, takes you through Sue's creative process of designing, planning and executing highly textural pieces. Discover the beauty of texture through an array of techniques. "Creative Stitching is based on my years of experience teaching thousands of students of all skill levels. It is designed to help you learn quickly and easily learn dozens of stitches that can be immediately applied to any project." 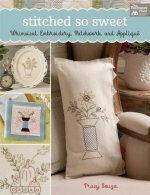 Best-selling author Gail Pan's sweet and sentimental embroideries take on a delightful new twist! Small patchwork quilts include spaces to spotlight interchangeable embroidery panels, making it easy to replace one pretty piece for another to reflect the time of year. Four types of projects inspired by seasons, holidays, celebrations, and the comforts of home mean there's always a beautiful stitchery to display. In addition to small quilts and framed art, Gail even includes seven embroidered banners for all kinds of occasions they'll make even ordinary days special. 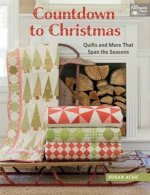 Best-selling author Susan Ache returns with a dozen spectacular quilts for Christmas. And most can be displayed year-round! Many quilters want to decorate with Christmas quilts during the holidays - but who wants to pack them away for 11 months of the year? Softer shades of red and green suit all seasons, whether snuggling up on the couch in December, enjoying late-night campfires in June, or relaxing on the deck in October. Choose among exquisite quilts with traditional roots and lighthearted quilts that capture the magic of the season. When Christmas rolls around, any of them can take center stage. Sew your love into the gifts you give. Patterns for a hand-lettered alphabet in two sizes make it easy to embroider heartfelt phrases or to personalize projects with names, dates, sayings, and more. Whether you want to celebrate, inspire, empower, or comfort, these charming gifts will come from the heart.